Mumbai: Madhya Pradesh Chief Minister Shivraj Singh Chouhan has said that country’s integrated development is possible only through all-round development of states. The Chief Minister was addressing the special “Make in India” event during Madhya Pradesh government’s presentation in Mumbai on 17 February 2016. 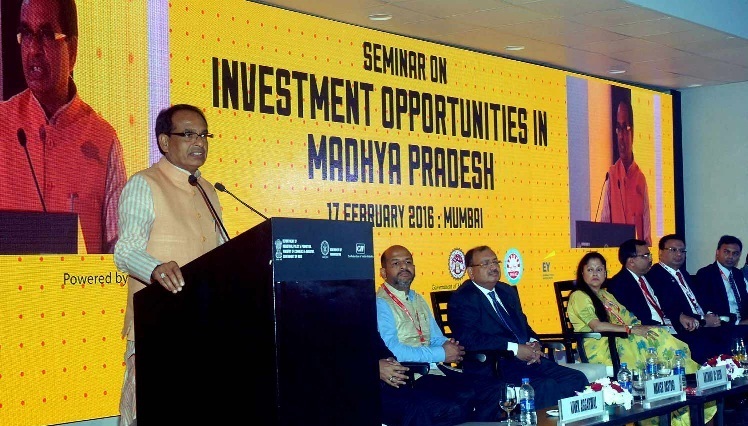 The Chief Minister said that Madhya Pradesh has been developed as an ideal state for investment. The state is not only an island of peace, but has also 24X7 power supply, adequate water for industries and progressive policies to attract investment in industries like textiles, defence manufacturing and food processing. The Chief Minister said besides being an agrarian state, Madhya Pradesh has also got trained labourer force, and manpower with technical education. The state also boasts of simple and investment-friendly labour laws, he said adding unnecessary inspections of factories have been abolished. The Chief Minister invited those present to attend the Simhastha festival in Ujjain from 22 April 22 to 21 May this year. He said that Madhya Pradesh has shrugged off the BIMARU (sick) tag (till now associated with Bihar, Madhya Pradesh, Rajasthan and Uttar Pradesh) and is now counted among the leading states. Three cities in Madhya Pradesg have been included in the national Smart City Project. Not only industries, the state has also taken big strides in the tourism sector. Recently, a hugely attractive tourist destination has been developed at Hanuwantiya in Khandwa district, the chief minister said and urged investors to visit the state to enjoy its various tourist destinations even if they do not invest in the state. Commerce and Industries Minister Yashodhara Raje Scindia enumerated 4 landmark features contributing immensely in putting the State on a fast track of industrial development. These include leadership, location, labour and land bank. She said that the state has witnessed growth beyond imagination under the able leadership of Chief Minister Chouhan. She went on to give the assurance to the captains of industry that investment in the state is both reliable and safe.